Hosted by the China Council for the Promotion of International Trade Haikou, Course Management Committee of China Golf Association, Hainan Golf Association, Haikou Bohui Exhibition, 2011 China (Hainan) International Golf Sports Show will be held 25th to 27th Feb 2011 at Haikou International Convention & Exhibition Centre. The 2011 China (Hainan) International Golf Sports Show will have 4 exhibit areas: Golfers’ Accessories area, Commercial exhibition area of golf course construction and facilities, golf service area, and golf tasty life service area. Clubs, golf equipment and accessories: golf clubs, shafts, grips, golfballs, tees, golf bags, golf sets, golf equipment manufacturings, golf equipment design and process technology, swing testing equipment, club testing equipment, training aids, swing analysers, etc. Apparels and accessories: shoes and hats, gloves, golf dressing, high-ranking casual wear, children’s golf clothing, caddie clothing, golf footwear, socks, gloves, belts, towels, clothing bags, golf shoe bags, spikes, etc. Fashion and personal care goods: glasses, bracelets, golf gifts, sunscreen, skin care products, trophies, etc..
Project planning of golf course, project tenders, course planning, landscape design, construction, course lighting, operation management and golf cart sight-seeings, etc., all kinds of golf carts and accessories; lawn machinery: machines, equipments and technologies needed in the course, including shearing, punching, cleaning machines and accessories, golf clubs; irrigation equipment: sprinkling irrigation, pumping appliance and accessories; biopesticide and chemical fertilizer: grass seeds, pesticides and chemical fertilizer; driving range equipment and appliances: driving range equipments, driving pads, ball setting machines, ball collecting equipments, ball cleaning machines, dividers, golfball bag shelves, purse nets, etc.. Golf design and construction companies of the foreign countries, consulting and management companies of course investment and development, golf event organization frameworks, golf media, golf educational training organizations, simulated practices, analytical instruments and softwares, souvenirs, prizes and presents. Financial planning products, real estate and log cabin supporting facilities, mid-range and top-of-the-line golf carts and mating products, high-end audio equipments, health cares and medical treatments, premium grade recreational activities, vintage wines and coffee, golf courses, clubs, recreation resorts, tourist services, etc..
Hainan is the province of extraordinary tourist attractions in China. It is the tourists’ most favorite destination for vacation，recreation with the sun, sand and the sea. 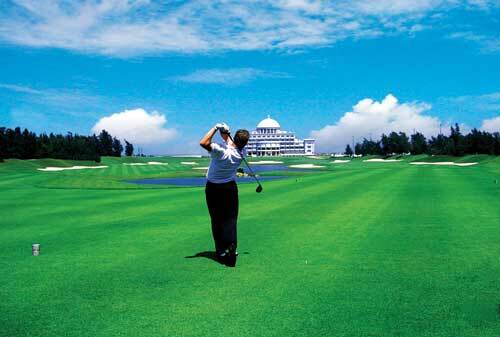 Golf is one of the key offerings in Hainan. Hainan has been commissioned to become a forefront international tourism island resort, while at the same time, the local government has specifically committed itself to the promotion of the golf industry as an integral part of the project. In addition to hosting the Asian Boao Forum with emphasis on Golf and Yacht, Haikou has been designated to become "the Capital of Golfing Tour in China.". With the splendid sunshine, sea breezes and fresh air, golf certainly will be a golden bright spot of Haikou. Golf will also be a strong force in elevating this great city on the tourist map of the world. While the real urban development and the tourist popularity of Hainan are rising, the stage is set for golf industries in Hainan. Golf industry is entering into a great historical moment of opportunities in China, which will extend toward becoming a broad-based popular sport for health and recreation, a departure from its previous roles serving only certain higher income bracket people only. Golf has already been a very common and popular sport in the developed countries. The continuing rapid economic growth in China and the hosting of 2008 Olympic Games have helped popularize golf sports in China rapidly. At the same time, the investment of golfing real estate, golf courses and the wider general acceptance golf among Chinese will inevitably lead to a rapid growth golf of population in China. In order to promote the development of golf industry in China, the committee, the authorities, golf guild, business leaders and golf celebrities in Hainan will establish an international communication platform with the guests from the United States, the United Kingdom, Australia, France, Italy, Japan, South Korea, Germany, Malaysia, Singapore, Thailand, Hongkong China, Macao China, and Taiwan China, which can also provide the foresights, and strategies for the development of global level golf activities and the promotion of the exchanges and cooperations relevant to golf around the world.